It has been a year of learning and adapting. 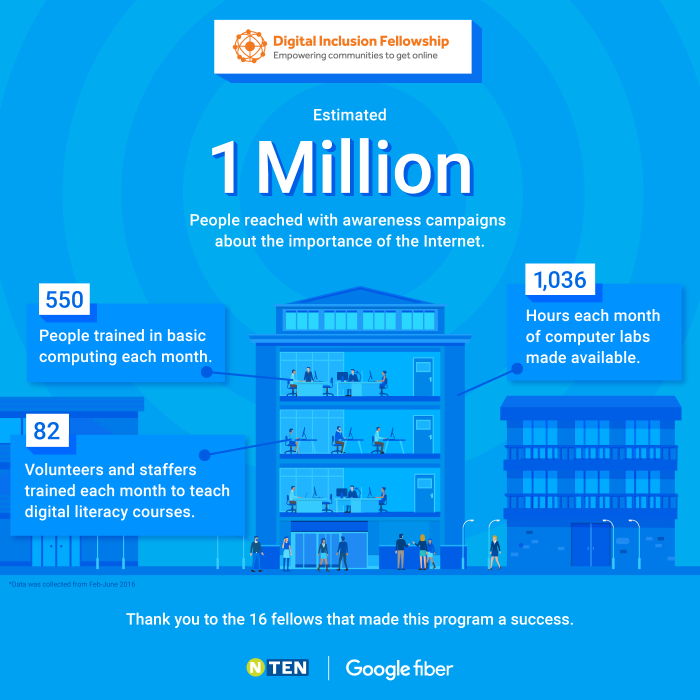 As we close out the pilot year of the NTEN Digital Inclusion Fellowship Program, launched in partnership with Google Fiber, we have been capturing the lessons and successes we have all experienced, learning from them in order to continuously improve our program and achieve the best possible impact for the communities we serve. We want to take this opportunity to share some of the successes and challenges Fellows and City Hosts have encountered throughout the first year of the Fellowship, with the hope of helping to inform organizations seeking to start or expand their own digital inclusion work. We invited four organizations involved in the 2015-2016 cohort to share their work and future aspirations: Skillpoint Alliance, Austin Free-Net, Martha O’Bryan Center, and the Charlotte Mecklenburg Library. 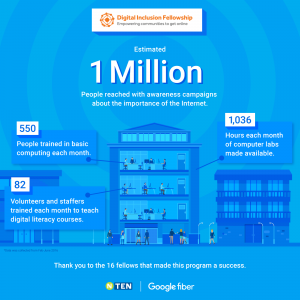 These organizations have provided reflections and tactical tips covering their experiences in working in digital inclusion with the support of the Fellowship. They share their expertise on how to make the case for digital literacy as part of your mission, integrate digital literacy with other programs, identify community needs, expand digital literacy programs, identify partners around digital literacy, and build awareness around internet relevance and digital skills. 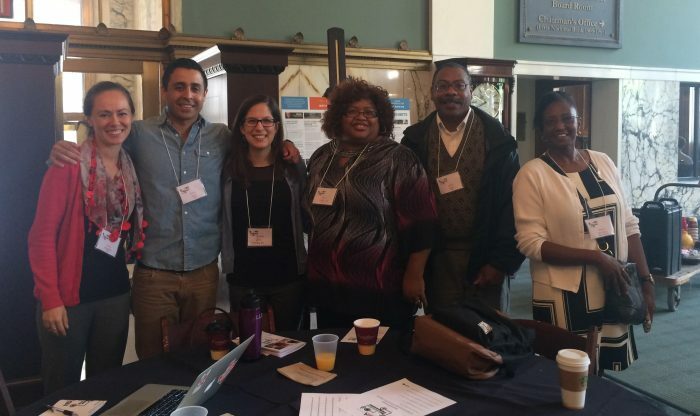 Additionally, with the input of Fellows and City Hosts, we have created the Digital Inclusion Fellowship Toolkit to support practitioners in building digital literacy programs within their organizations and with community partners. 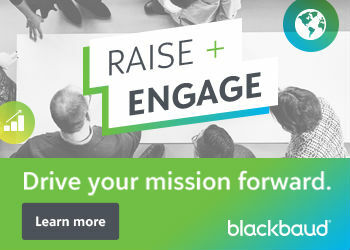 The toolkit provides a slew of resources on topics ranging from best practices on volunteer recruitment to classroom logistics, digital literacy resources to partnership development. We believe this document can be a key hands-on resource to accelerate the implementation of digital literacy programs in your communities. Over the year, we have also been keeping track of the amazing work done by our Fellows and City Hosts, and have been astounded at everything they’ve achieved. In Raleigh-Durham, Fellows Mike Byrd and James Butts helped launch a Digital Inclusion Taskforce to coordinate efforts on this critical issue. In Salt Lake City, Alonso Reyna Rivarola created multilingual user enrollment guides, presentations, and workshops for PowerSchool, giving parents the opportunity to connect to their children’s schools and teachers online. In Nashville, Susan Reaves organized the Get ‘Em On Public Service Announcement competition, which resulted in a powerful video created by a teen on the importance of digital inclusion, and reached thousands of views in the Nashville community. Sarah Bell, DeAndre Pickett, and Adam Strizich (Fellows at Literacy KC, Literacy Action, and Martha O’Bryan Center, respectively) spurred their organizations to integrate digital literacy across their program offerings. Fellows have also shared stories of participants finding jobs within a week of learning to type a resume, parents being able to help their kids with homework for the first time, and immigrant families finally being able to connect with their communities abroad. All told, in the last six months of the Fellowship, our 16 Fellows reached an estimated 1,000,000 people with awareness campaigns about the importance of the internet using TV, radio, social media, and door to door canvassing. Additionally, our Fellows trained an average of 82 staff and volunteers monthly to support digital literacy classes in their communities, and trained 550 participants on a monthly basis on digital literacy skills. Outside of formal trainings, Fellows and City Hosts made their computers labs available for over 1,000 hours per month. Their success didn’t end there: In addition to their groundbreaking work in their communities, the Fellows actively pushed and participated in a national conversation on digital inclusion. Daniel Lucio, Fellow at Austin Free-Net, organized the first National Day of Digital Inclusion, surfacing digital inclusion issues and best practices across the country. Fellows, City Hosts, and program staff also presented at myriad conferences: Partnership for Progress on the Digital Divide; NetInclusion; Schools, Health, and Libraries Broadband Coalition; the Gigabit City Summit; the Nonprofit Technology Conference; Leading Change Summit; and the Young Nonprofit Professionals Conference. As we celebrate the successes of our first cohort of Fellows, we are fortunate to know we are not saying goodbye. One of our Fellows (Daniel Lucio) is moving on to work on digital inclusion for Google Fiber, Ruben Campillo is the new Digital Inclusion Outreach and Community Engagement Manager at the Knight School of Communications, and all of our first year Fellows have stated that they plan on bringing a digital inclusion lens to their professional plans. Join me in celebrating their successes, and also in welcoming our 22 new Fellows, with the second Fellowship cohort that began last month, building on and expanding the work of our first year.